Make this Mesquite-Tea Ribeye steak in the slow cooker. 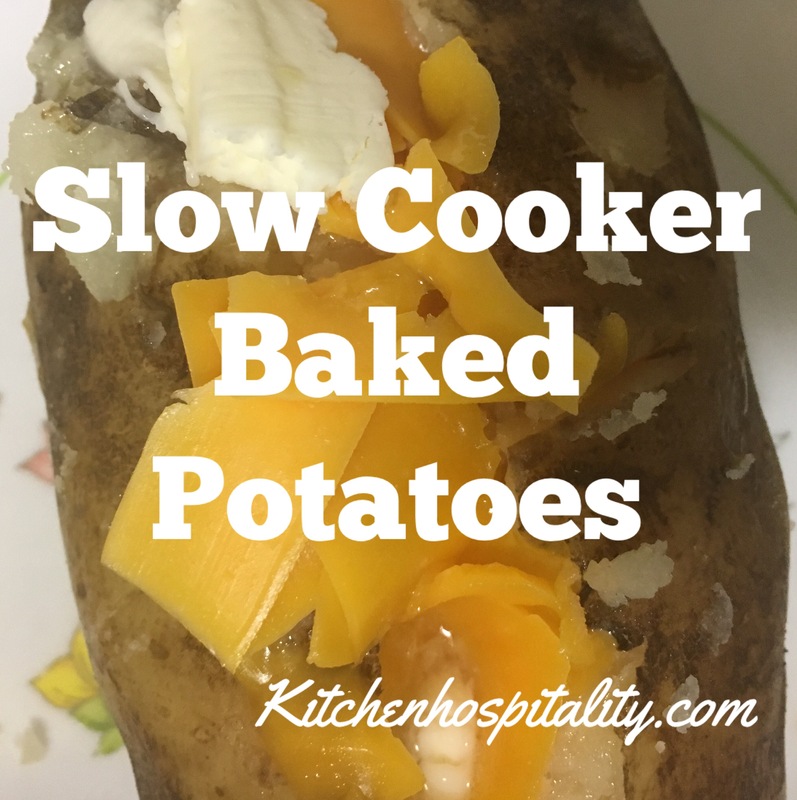 You can add potatoes in the same pot and have a complete slow-cooked meal. Serve a ribeye dinner to your guests. Easy. No fuss. Season and marinate and pop into the slow cooker. It’s that easy. You’ll love this ribeye dinner, and so will your guests. What’s even better? You can take the time to visit with your company because you don’t need to stand over the grill. The slow cooker does the cooking for you. Yep. It’s that simple. Add baked potatoes with the ribeyes, and you’ve got an even easier meal. No grilling. No baking in the oven. It’s all done in the slow cooker. All you need for the potatoes are olive oil, foil, and the trimmings. Make it easy on yourself and get already-grated cheese, sour cream, and bacon bits. If you prefer real bacon and don’t mind the extra time required, fry bacon. It’s definitely tastier that way. Oh, and don’t forget the butter. Real butter. Salted butter. Oh yeah! Now wrap those potatoes and cook them with the steaks. See my recipe below. Add a salad to your ribeye and baked potato meal. Or, why not insert another piece of foil into the slow cooker and add Brussels sprouts or zucchini. Easy. No hassle. Delicious. Healthy. The easiest way to include simple-to-make veggies is to cook them at the same time with your meat in a slow cooker. Include as many vegetables as you want, depending on how many you are serving. If you’re inviting a large dinner party, cook in an oval seven-quart slow cooker so that you have plenty of room to add more vegetables and steaks. 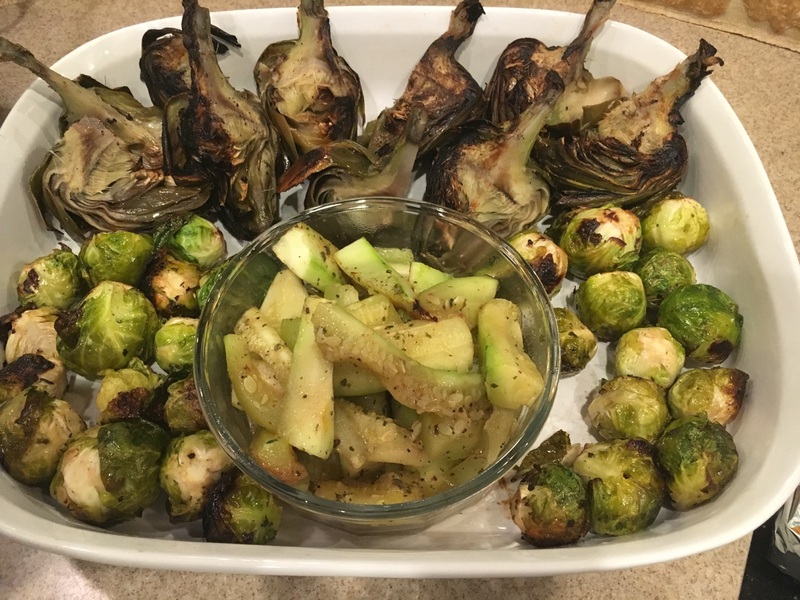 Ask your guests to bring veggie appetizers. Serve veggie chips from the grocery store. Purchase veggie trays from the grocery store. Buy a bag of coleslaw and add mayo, a little sugar, your favorite flavored vinegar and sweet pickle relish to it. See how easy it is to serve vegetables? Again, no fuss. Simple-to-make veggies. Rub oils on potatoes. Wrap potatoes in foil and place in bottom of crockpot. Season both sides of two ribeyes, bone in, and rub in 1/4 cup marinade on both sides of steak. Place a sheet of foil on top of potatoes, turning sides of foil up to make sort of a bowl then place the steaks in foil bowl. Pour any remaining marinade around the sides of steaks. Place lid on and cook on high for 8 hrs. This recipe is for two 16-ounce ribeye steaks and two baked potatoes. 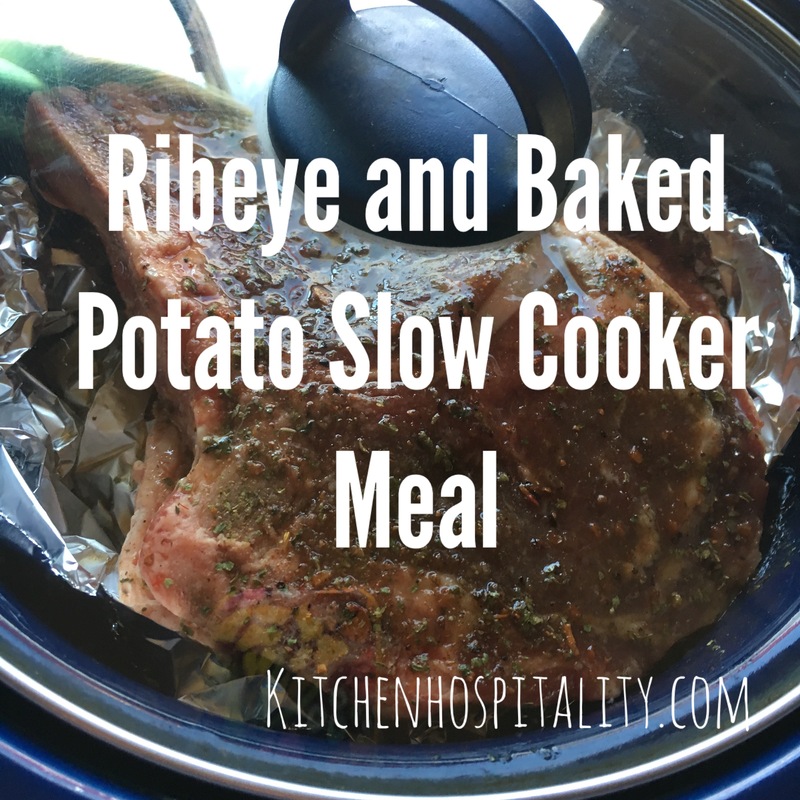 If you have the large oval slow cooker, you’ll be able to cook more steaks and potatoes. The calories for one baked potato (without the trimmings) and one 16-ounce ribeye steak are approximately 1,635 calories – a lot of calories! Also, one 12-ounce ribeye is about 900 calories. So you can cut calories if you prefer by either purchasing smaller steaks or by only eating a small portion. 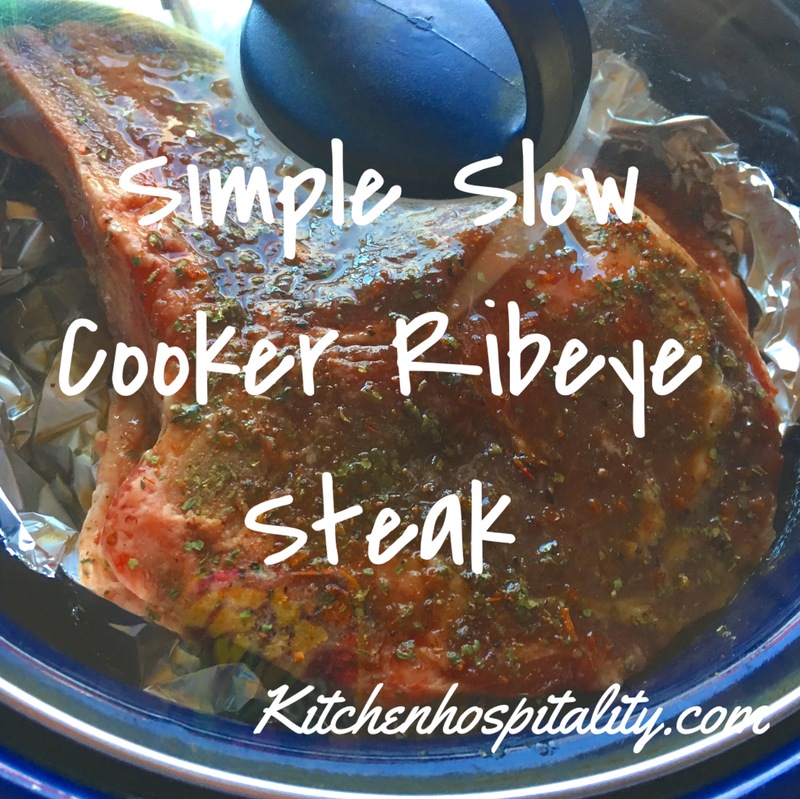 Enjoy your ribeye slow cooker meal! @Angie- do you have YouTube channel? i want to make this in weekend expect more close interaction with videos. i love your Mesquite-Tea Easy Ribeye and i feel this will be delicious after completing whole process. Hi, Winslet. Yes, I do have a YouTube channel. I’ve recently started making recipe videos and hadn’t uploaded any yet. However, here is one of the videos I have uploaded…https://youtu.be/onZxbs4qV0k – it’s how to fry over-medium-well eggs. 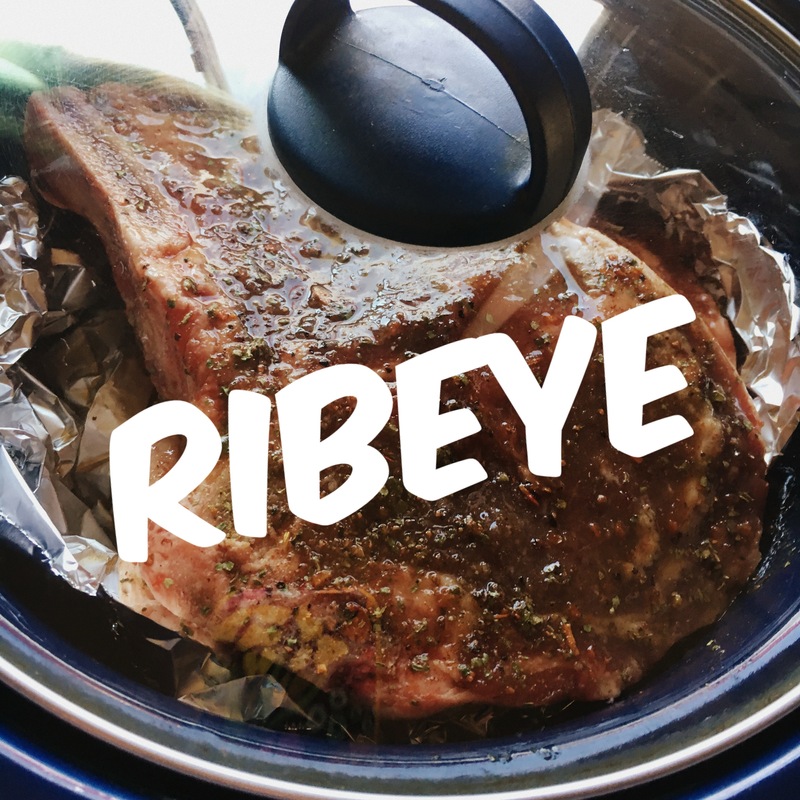 I will work on uploading my ribeye slow cooker recipe on the channel. Look for it tomorrow. Thanks so much!! This looks so good. Do you have a recipe for the marinade or is it bottled? I’ve never heard of a mesquite tea marinade, but it sounds delicious. I used a particular Sweet Tea marinade brand and combined it with a mesquite seasoning. Oh my goodness, it was definitely GOOD!! I will have to check my local stores for Sweet Tea Marinade. Is it just a local, Texas, thing or do they ship? It is a Texas thing, but they may ship.